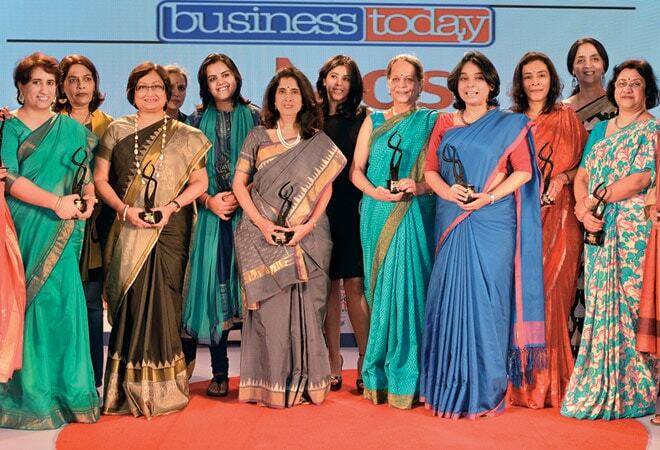 The victorious ones: (From left): Kaku Nakhate, Guneet Monga, Bharati Jacob, Pallavi Shroff, Sonali Kulkarni, Neha Kirpal, Shanti Ekambaram, Kotak Mahindra Bank, Ekta Kapoor, Nishi Vasudeva, Sangita Singh, Aruna Jayanthi, Chitra Ramkrishna, Arundhati Bhattacharya, Rekha Menon, Anita Dongre, Zarin Daruwala. The awards of Chiki Sarkar, Neelam Dhawan, Nisaba Godrej, Prabha Parameswaran, Roopa Kudva and Vinita Gupta(not in picture) were received by their appointed representatives. Photos: Rachit Goswami & Danesh Jassawala. It was an evening reserved to honour grace and fortitude. An eclectic mix of women from across the business fraternity had flocked together for the 11th edition of the Most Powerful Women (MPW) in Indian Business Awards at the ITC Grand Central in Mumbai on August 13. A quick glance around and one saw the usually formal Nishi Vasudeva, Chairman and Managing Director of Hindustan Petroleum Corporation Ltd, interacting freely with other guests. For her and many others, such an event, indubitably, offered an avenue to build long-term relations. 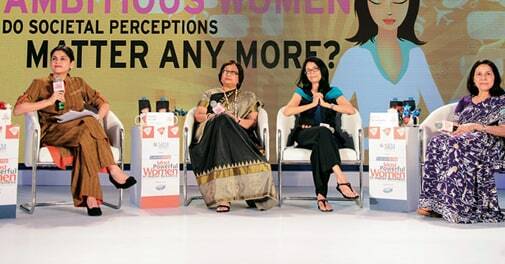 Chief guest of the day Padmasree Warrior, Chief Technology and Strategy Officer, Cisco Systems, was at her candid best when she exhorted the women leaders to seize the opportunities that the world offers. She said women tend to second guess themselves. Dwelling on her personal experience while hiring, she said women ask for time to think over a job offer whereas men, nine out of 10 times, take no time in accepting an offer. "Walk through a door when it is open," she said. Warrior said that in the next 10 years the technology industry would look very different thanks to changes in business models. For the business environment to change, she said, senior leadership need not know all the answers but they should ask the right questions. "Leaders have to get to the level of being comfortable with ambiguity and being able to change," she said. Setting the tone for the event, Aroon Purie, Chairman of the India Today Group, expounded on how the MPW list has evolved over the years. He said in the early years the list used was dominated by CEOs from banking, financial and media services, but now has a wider array of robotics manufacturing, the public sector, art, film production, legal services, publishing, FMCG and technology. He quoted from Sheryl Sandberg's book, Lean In: Women, Work, and the Will to Lead: "There is a special place in hell for women who don't help other women." He said: "I'd think there is a yet more special place in hell for those men who don't help women. It would be filled with lots of unhappy women. I at least will not take chances!" 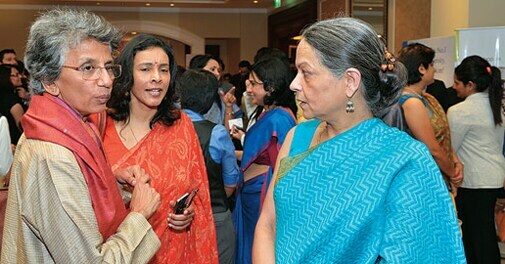 (From left) Accenture's Rekha Menon, Capgemini's Aruna Jayanthi and Nishi Vasudeva of Hindustan Petroleum Corporation during a casual conversation at the award function. The event honoured 22 women who were chosen by a jury from a list of nominees put together by BT and knowledge partner EgonZehnder. 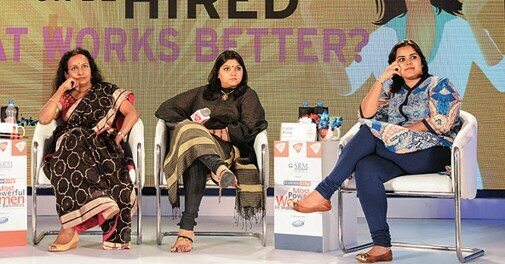 Three topical panel discussions witnessed disparate views from panellists with some pouring their hearts out. 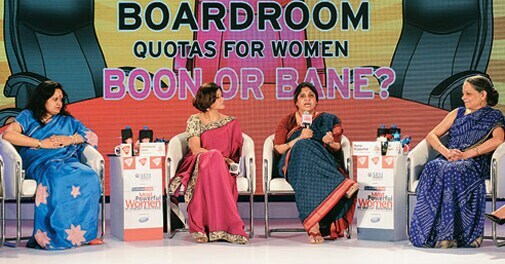 The discourse on "Boardroom quotas for women: Boon or bane?" saw myriad perspectives at play. Vasudeva was nuanced when she said, "If there is a way to start, this is the way." Rama Bijapurkar, an independent market strategy consultant, was cogent when she said the selection committee for a company board needs to work for more diversity. "Diversity de-risks you and not derails you." Ankhi Das, Director and Head of Public Policy, Facebook India, said, "It is more important to create conditions for success, rather than creating laws." 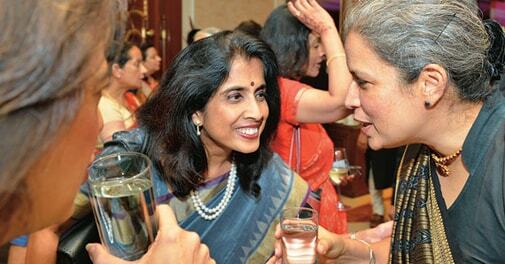 (From left) Shanti Ekambaram of Kotak Mahindra Bank and Fanuc India President & CEO Sonali Kulkarni engage in a chat after the award ceremony. In the second panel discussion "To hire or be hired: What works better? ", Renuka Ramnath, Founder, Managing Director and CEO of Multiples Alternate Asset Management, said being an entrepreneur taught her to be grounded and leave behind the comforts of a salaried job. She believes that working for oneself is the best option. "When you can hire someone, you should never work for someone else," she said. India Today Group Chairman Aroon Purie and Cisco's Padmasree Warrior engage with the audience. In the discussion "Ambitious women: Do societal perceptions matter anymore? ", panellists agreed that for women to be ambitious, family support is a must. Zarin Daruwala, President, wholesale banking, ICICI Bank, said though women do well in service industry, adjustments have to be made. Pallavi Shroff, Senior Partner, Amarchand & Mangaldas & Suresh A. Shroff & Co, narrated workplace anecdotes to point out how male-dominated legal profession is. "You are in a man's world. Do everything that you're expected to do in your job," she said. 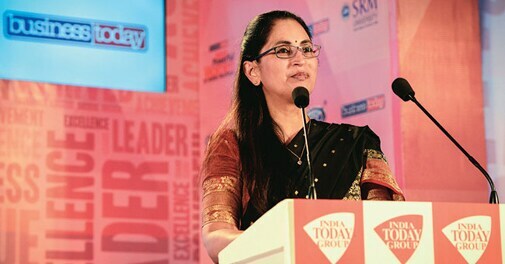 Nine newcomers, including Arundhati Bhattacharya, Chairman, SBI; Anita Dongre, Founder and CEO, AND Designs; Sonali Kulkarni, President and CEO, Fanuc India; and Guneet Monga, CEO, Sikhya Entertainment, were among the award winners. Inspiring all: Padmasree Warrior, Chief Technology and Strategy Officer at Cisco Systems and chief guest at the awards function. SRM University was the presenting sponsor of the event. Associate sponsor was EBCO, and beverage partner was Signature Packed Drinking Water. The evening was not just a celebration of successful women but also a tribute to struggles the winners faced with grit and determination in their journey to the top.